First chop the shallots and place them in a saucepan with the vinegar to infuse. Next, strain and reserve the vinegar. 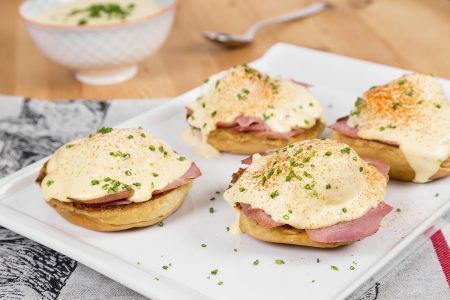 To make the hollandaise sauce, place all the ingredients (infused vinegar, water, salt, lemon juice, yolk and butter) in a 98% vacuum bag and cook it in the SmartVide thermo circulator for 90 minutes at 65 °C (149ºF) for the stipulated time. Remove the bag and reserve it. Cook the eggs in the SmartVide for 24 minutes at 70 ºC (158ºF). While the eggs are cooking, open the previous bag, put the sauce in a blender and emulsify at full power. This will obtain a consistent sauce. To finish, open the rolls and toast them in a pan with a little butter until golden; place the ham on top and heat them under the grill. When the eggs are cooked, peel them carefully and place them on top of the rolls with the ham. Cover the eggs with the hollandaise sauce and grill a little until golden brown. To serve, just sprinkle some paprika and the Benedictine eggs are ready to enjoy. Using the vacuum technique, it is easier to make hollandaise sauce and, also, it is more difficult to cut. It also means the sauce can be cooked in advance and reserved for when it is needed. You can have this rich and labour-intensive sauce to hand!